The 700-watt unit delivers up to 22,000 RPMs. Accommodates anything from pineapples, melons, apples, oranges, and grapes to tomatoes, celery stalks, cucumbers, carrots, spinach, and more. Features a surgical-steel juicing blade and metal filter. Housed in durable stainless steel. Backed by a 90-day limited warranty. MSRP $108 Based on the Manufacturer's Suggested Retail Price, this juicer is priced about average. Motor Warranty 90 Days When compared to other juicers, this appliance has a shorter than average limited motor warranty. The motor warranty is a good indicator of motor durability. Appliance Warranty 90 Days This juicer has a shorter than average limited appliance warranty. Again, the warranty is a good indicator of overall durability. 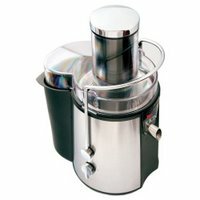 Star Rating 4.4 User reviews, ratings, and feedback indicates that this juicer is rated higher than average by 10 users and ranks in the top 29% of juicers.